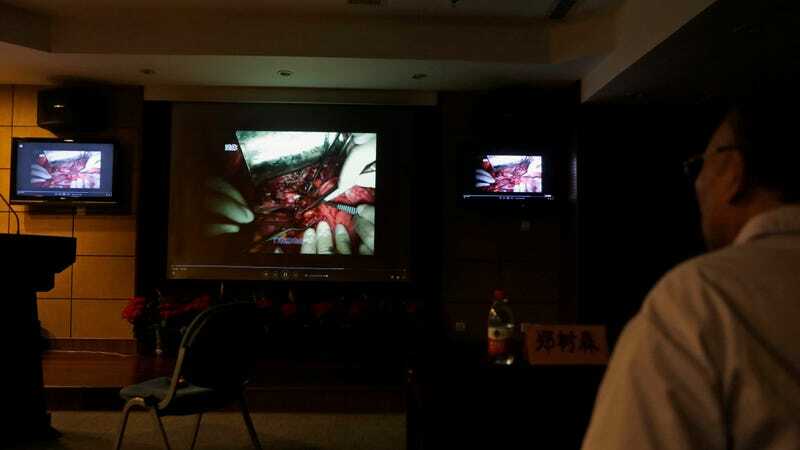 A doctor watching a liver transplant at a hospital in Hangzhou in eastern China’s Zhejiang province in 2013. A new study published in BMJ Open has called for over 400 scientific papers on the subject of organ transplantation to be retracted because they did not comply with international ethical standards designed to ensure the organ donors freely consented, the Guardian reported this week. Rogers and her team obtained all research papers reporting on Chinese transplant recipients published in English-language medical journals between January 2000 and April 2017. The 445 studies they identified involved 85,477 transplants. But 99% of those studies failed to report whether organ donors had given consent for transplantation. The 19 studies which claimed no organs from executed prisoners were used took place prior to 2010, when there was no volunteer donor program in China. It is the first time a study has tracked the progress of the transplant community in blocking unethical research. A 2016 report by former Canadian lawmaker David Kilgour, human rights lawyer David Matas, and journalist Ethan Gutmann alleged that within China, there is a massive discrepancy between publicly-reported numbers of organ donations and the number of organ recipients, according to CNN. That report claimed that the Chinese government only provided evidence of around 10,000 legal transplants annually, but that statements and records from Chinese hospitals suggest many more than that number actually occur. The gap between the officially reported donor numbers, the authors alleged, and the number of estimated transplantation operations could only be explained by executions. China is estimated to execute a few thousand prisoners a year—a tally more than the rest of the world combined—with the exact total being a state secret. Allegations have persisted that the organs may also be coming from dissidents, members of state-persecuted ethnic groups, and practitioners of Falun Gong, a spiritual tradition the government has labeled a cult. However, as the South China Morning Post reported this year, both Amnesty International and Human Rights Watch have said they are unable to verify whether these claims are accurate. “As for the testimony and the published report, I want to say that such stories about forced organ harvesting in China are imaginary and baseless—they don’t have any factual foundation,” Chinese Foreign Ministry spokeswoman Hua Chunying told CNN. Some doctors, as well as members of Doctors Against Forced Organ Harvesting, said in 2016 that Chinese government denials the practice has continued cannot be verified, according to the New York Times. A 2017 Washington Post report, however, noted that many sources including immunosuppressant supplier Quintiles IMS, medical researchers, Chinese hospitals, World Health Organization transplantation program chief Jose Nuñez, and Liang Xiaojun, a lawyer who said he had represented hundreds of Falun Gong members, all contested claims made in the report. A growing consensus among transplant experts is emerging that China has made major strides towards eliminating the practice of forced organ extraction, the Post wrote. In 2018, Huang told the BBC that six million people die per year in Chinese intensive care centers, and even if a very small percentage of them donate their organs, that would be enough to cover needs. But the controversy lives on. As the Guardian noted, in 2017 the Liver International Journal was forced to retract a study by Chinese surgeons on the outcomes of 564 live transplants after experts said it was “impossible for one hospital to have obtained so many useable livers” given the small number of volunteer donors in China and the viability of the livers they might provide. The latest study led by Rogers concluded that the Journal of American Transplantation and the journal of The Transplantation Society also published research that did not comply with the international ethics standards, the Guardian wrote.